These are familiar waters for Stewart, who has published previous books about the creation of the US Constitution and Aaron Burr. Stewart offers a compelling detail rich account of the United States first six decades with especial attention to the ratification of the Constitution and Bill of Rights, the political infighting that accompanied the birth of a nation, and Madison’s administration and the War of 1812. The titular five partnerships are with George Washington, Alexander Hamilton, Thomas Jefferson, James Monroe (first opponent of Constitutional ratification to serve as president), and Dolly. While demonstrating his storytelling powers, this organization often proves a challenge since these relationships overlapped rather than unfolding sequentially. Moreover, exploring these vital decades through Madison’s eyes means that those issues in which he was not involved do not appear. One can search in vain, to cite one example, for the Barbary Pirates, an early example of using American military force in service of commercial interest. More surprising, the critical Supreme Court case that bears his name, Marbury v Madison, can be found only in a single footnote. 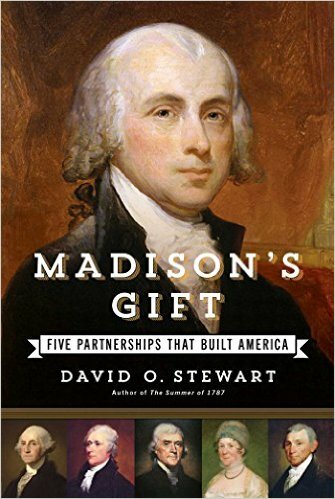 Stewart also devotes a great deal of attention to Madison’s relationship with slavery which was far more than ambivalent. Madison was perpetually land and slave poor, yet he could not bring himself to sell any of his people until near his end. Instead, he sold off inherited lands until he held too little acreage for all the people depending upon it. Consistently paternal in his attitudes toward the enslaved, he could never bring himself to emancipate them nor unequivocally renounce the peculiar institution. Yet, he realized for most of his life that slavery undermined the principles he espoused and created the north versus south schism that he predicted as early as 1787 would tear the nation apart. Indeed, at the Virginia ratification convention, Patrick Henry charged that if the Constitution were adopted, the northern states would use it to end slavery. Whether Stewart devotes too many pages to the topic is a valid question. What does Madison’s Gifts tell us about early localist thought in the new nation? By seizing the misnomer “Federalists,” Hamilton, Jay and Madison put their opponents, the localists who supported actual federalism, on the defensive with the negative moniker “Antifederalists.” The latter never agreed on strategy – whether to reject, demand amendments first, or ratify with proposed amendments. The House, in which Madison served, sent 17 proposed amendments to the Senate, which removed five that protected individuals from actions by individual states, leaving mostly those that protected the states from Congressional action. In the post-Citizens United era of expansive corporate personhood, which David Korten cuts to ribbons, Hamilton’s assertion during the Constitutional Convention that the states mere corporations with limited powers rings with a sad irony. In perhaps the most profoundly localist act by a local government in American history, Nantucket enter into a separate peace with the British in 1814. By January 1815, however, Hartford Convention only complained and demanded repeal of the 3/5 clause, rather than calling for New England states to secede. The original Republican principles, containing a good deal of localist thought, did not survive the War of 1812, symbolized by Madison reviving the Bank of the United States and advocating for a standing army. In December 1815 he called for spending on internal improvements, although he vetoed Henry Clay’s bill to that end on his last day in office, March 3, 1817. Madison and Jefferson had responded to the Federalist-backed Alien and Sedition Acts of 1798 by drafting the Kentucky and Virginia resolutions, explaining how the states could call for the nullification of a Federal law contrary to the Constitution. To Madison horror, these arguments reemerged after the 1828 Congress passed what Southerners called the “tariff of abominations.” Southerners insisted Congress could not enact a protective tariff, just revenue. Tariffs had long before become the proxy issue for discussing slavery. Former Vice-President John C. Calhoun argued that the resolutions of 1798 gave states the right of nullification and claimed that a special convention in just one state could declare a federal law null and void. Seeing his words used against his beliefs, the aged Madison wrote a refutation of nullification in early 1830. He argued that nullification would replace the delicate balance of a written constitution with the unilateral opinion of one state. In retirement at Montpelier, Madison expressed conservationist ideas, decrying the leveling of forests and failure to maintain soil with amendments and rotation. The latter certainly resonates with localist today who are gravely concerned with the loss of topsoil.